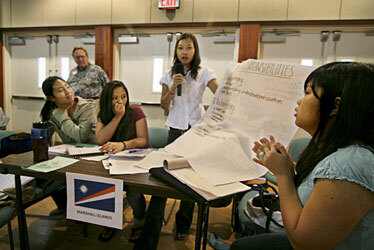 Hannah Chan of UH Lab School and Mahal Brillantes, Lin Rue Li and Rochelle Sugawaof La Pietra High School presented their views while they represented the Marshall Islands yesterday as about 160 Oahu high school students held a mock international summit at Hawaii Tokai International College. Delegates from 12 countries convened at the auditorium of Hawaii Tokai International College yesterday to discuss reducing carbon emissions during the next ten years. Most of the delegates wore jeans and sneakers, with some sporting sandals. The delegates -- actually about 160 Oahu high school students -- were participating in Global Visions Summit 2008, a one-day conference designed to teach the students about global issues and how those issues affect them. Climate change was the topic this year, the 54th year of the summit, because of the recent international climate change conference that brought delegates from 16 countries to Hawaii last month. The students took on the roles of representatives from different countries and researched how their country tries to balance the needs of the economy and the environment. After some 90 minutes of negotiations, six of the 12 countries present signed a three-part proposal with felt-tip markers. The proposal had the countries accept responsibility for reducing greenhouse gases, the United States promise to provide aid to help other countries reduce carbon emissions, and each country contribute to a newly formed international agency that researches alternative fuels. "This summit to a certain extent was successful," said Davin Aoyagi, 16, a junior at Mid-Pacific Institute, who represented Japan. "However, the fact that China refused to sign this treaty was a momentous mistake." Students Brent Duarte, Sara Ueoka, Bianca Nagata, Nolan Higa and Lauren Ikeda of the Pacific Buddhist Academy listened intently to the discussion yesterday. "Overall, it was a very rewarding experience because I was able to learn the different opinions of different nations and their stance on global warming and global climate change," said Sae Umezawa, 16, a junior at Sacred Hearts Academy, who was representing the United States. The conference was organized by the Pacific and Asian Affairs Council and sponsored by the Center for International Business, Education and Research at the University of Hawaii at Manoa. "It's a really good experience because it lets teenagers understand what really goes into discussions on the international level and it makes terms like U.N. and climate change more relevant to my generation," said Chris Ballesteros, a senior at Damien High School. Bianca Nagata, 15, a sophomore at Pacific Buddhist Academy, represented India. "We put economy first," she said as an Indian delegate. "Our nation is industrializing pretty fast and we just don't want to fall behind." But as a student who will one day experience the effects of global warning, she said, "Some countries, they actually value money before the world. If we don't have a world, we're not going to survive."